Synopsis: (From Goodreads) Acclaimed author M. L. Tyndall begins a riveting new romantic adventure series set against the rich backdrop of the War of 1812.
Review: I was pleasantly surprised by this Amazon ebook freebie. 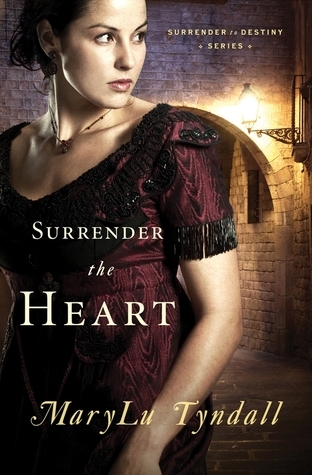 Surrender the Heart is a historical romance novel which probably also falls under the Christian fiction genre, which admittedly is not usually my thing but it was a subtle undertone of the book and didn’t distract me from the story too much. their engagement party early to go off to sea on his merchant ship to deliver cargo to England, Marianne is humiliated in front of her society and chases him down. It’s a little unbelievable how she ends up on the ship, but she does and so she ends up on the three month voyage out at sea. She is terrified of the sea and plots to sabotage Noah’s voyage so she can be returned to her ill mother. Noah reignites his childhood charm by treating Marianne sourly so that she will break off their engagement. So, Noah wants Marianne to break off the engagement whereas Marianne needs the marriage to go ahead so there is much pulling and froing in this respect. Noah still considers Marianne to be the snobby princess that she was as a child and she thinks of Noah as the bully child she once knew. When they are captured by the British Army on the brink of the war, Marianne and Noah must work together to free themselves from a life of slavery and maltreatment.